Brooke Shields is always praised for how well she looks in a pair of Calvin Klein jeans. However, the model and actress recently embraced how equally good she looks in a bikini. Ready for anything in my #PowerSuit. So happy to be a part of this @swimsuitsforall campaign — see the rest, link in bio! In being both confident in how she looks and feels, Shields shared to Health magazine her top 3 tips on how she stays bikini ready in her fifties. SoulCycle is a fitness company that offers indoor cycling workout classes and Brooke Shields has been a regular for the past 12 years. This is evident when you glimpse her sculptured frame and toned legs. If you’re looking for a low-impact form of exercise that works all your muscles, indoor cycling (spinning) is definitely the way to go. As it’s a low impact exercise, indoor cycling can also help to rehabilitate those suffering from joint or muscle injuries. Other benefits associated with indoor cycling include lowered levels of both stress and the risk of cardiovascular disease. 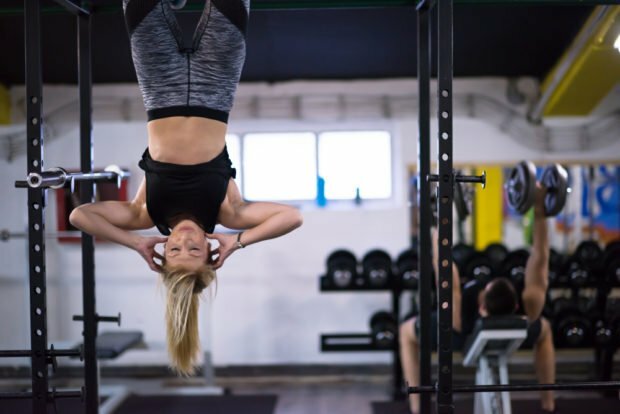 While hanging upside down may not sound pleasant, there are some great benefits. Inversion boots (gravity boots) are a pair of boots that one straps around their ankles before attaching them to the bar. Once this happens, they can then safely hang unsupported upside down. Not only can these boots improve spinal health by relieving pressure and compression, but studies have also linked the boots to reduced back pain. Moreover, with core strength being important to overall physical health, inversion boots help to improve core flexibility and strength. “I find that if I say, “I’m not gonna eat ice cream” or “I’m not gonna drink,” all I want to do is drink and eat ice cream. It’s some kind of psychological battle” she explained. Instead of depriving herself or feeling guilty about her treats, Shields makes sure that enjoys all that her diet has to offer, just in moderation. While your fitness and health should be important during the festive season, your relationship should also be a priority. Click here to find out how you can keep the fire burning during the holiday season.